Over the past decade, kitchen design trended toward having spaces full of appliances with stainless steel finishes. Stainless can give a kitchen an extremely sleek and elegant look, reminiscent of what you might see in a high-end restaurant or a modern home. Now, several years into this trend, parents with small children tell us that they wouldn’t have chosen stainless steel had they known the visibility of fingerprints and smudges. And, lately we’ve noticed a few manufacturers re-discovering white. 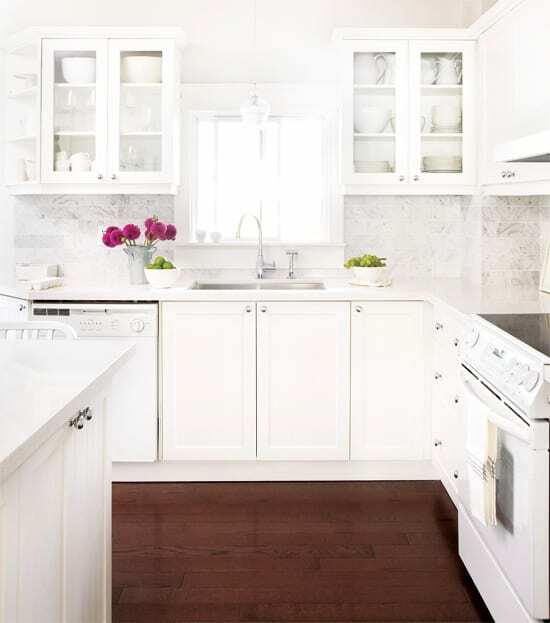 White can be a great choice for the next appliances you buy. Let’s take a quick look at some of the situations where this color is ideal – and highlight a few great appliances that come with a white finish. White is a traditional color in a lot of different contexts and housewares are no exception. But more importantly, the flexibility of white guarantees that it can go with a wide range of different kitchen layouts and furniture designs. No matter the color or finish of your cabinets, floor, counters, ceiling, walls or other appliances, white (like its opposite, black) goes with just about everything. At Designer Appliances, our designers have noticed that the white appliances we have in stock (online or at our flagship Upper Montclair NJ) go particularly well with Ikea cabinets, particularly those from the Akrum design collection. More than a few customers have asked about this match of late, and we’ve found that it offers a streamlined appearance that’s pleasing to the eye. Those on the lookout for a new white stove should take a close look at the Viking VDSC536T6BWH, part of the manufacturer’s Designer Series. This 36″ dual-fuel range has six pro-sealed burners, a high-powered oven with a wide range of cook settings and a child-safety feature that makes it perfect for households with younger children. This 24.8 cubic foot French door refrigerator comes in a white that’s pure as the driven snow, and it’s got plenty of attractive features to boot. Some of these include FreshSeal humidity-controlled crispers, spill-proof glass shelves, a water dispenser and digital controls. Also, it’s been ENERGY STAR-certified due to its efficiency. An efficient kitchen is nothing without a dishwasher, and Frigidaire truly delivers with this white model . Everything from its wash system and organizational capabilities to its large silverware basket and durable stainless steel interior is ideal for any homeowner. Also, this dishwasher boasts sensor technology that automatically selects the proper cycle for each load of dishes. Unwrapping the Miele Brilliant Plus Series coffee maker CVA4062BRWS in our office drew a lot of “ooooohs and ahhhhs” from our staff. Miele’s introduction of their Brilliant White Plus Series was as exciting to us as the unveiling of Apple’s iPhone. The puristic design of the glass (not to mention the easy-to-clean aspect) was unlike any appliance we’d seen before. Miele has designed a full suite of appliances in the Brilliant Plus Series that we think will innovate kitchen design. Winter is here, and for many, snow and snow days are upon us. A new oven or range stove the color of the winter wonderland outside your windows might “bring the outdoors in” with bright inspiration for creating seasonal treats. We are happy to show you what your choices are and what the latest white inspiration on the marketplace is.